This week I have been home and sick so have had lots of time to think. 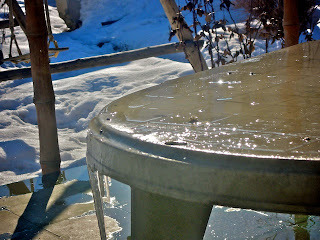 At the beginning of the week, I was feeling tired not only physically but emotionally from the cold and its challenges. I did not want to despair but found myself crying for what Big D said was two minutes after calling in sick to school. As I dried my tears, I looked outside and saw the sunlight shining down on the snow. I smiled at the wondrous gift God had given me. We had been days without sun and just having the sun shine in the window made the day seem brighter and warmer. When the sun does not shine, it is hard to imagine that spring will come. On the other hand, just a day of sunshine brings the hope of Spring and a reminder that we can make it through the rest of this winter. As I was thinking about the challenges of this winter in staying warm, worrying if we have a enough wood/fuel, staying well, and dealing with all the snow, I reminded myself that these are minor inconveniences compared to what many people face daily. For one local family in our organization, the winter just became longer as they lost three of their four children to a house fire. Hope is something they are struggling to see. For some, their long winter may be more figurative such as having a terminal disease. For others it is dealing with the grief of knowing a loved one is not coming back. Still others it may be a hard marriage or children making wrong choices. Some problems seem to have not solution or end in sight. It is easy to despair and lose hope. They do not see the Son so can't imagine Spring ever coming their way. Here is my prayer for those who are struggling in whatever long winter they are in.